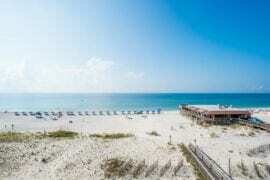 When you think of fantastic beach vacations, do you think of Alabama? If not, you should definitely have Gulf Shores on your radar! 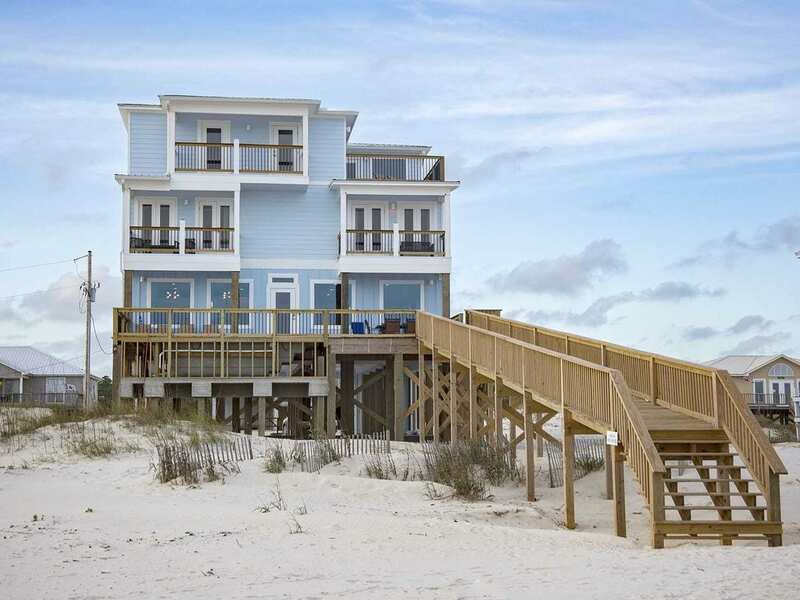 To help you out, we’ve curated a list of the best Gulf Shores VRBO homes for your next beach vacation. Found on Alabama’s southern shores, the Gulf Coast includes a state park with sandy white beaches, stunning golf courses, and even a wildlife refuge with sea turtles and all sorts of birds. Things to do in Gulf Shores, Alabama include hands-on animal encounters at the Alabama Gulf Coast Zoo, zip lining over the sand dunes, and all sorts of water activities like fishing, sailing, and paddleboarding. 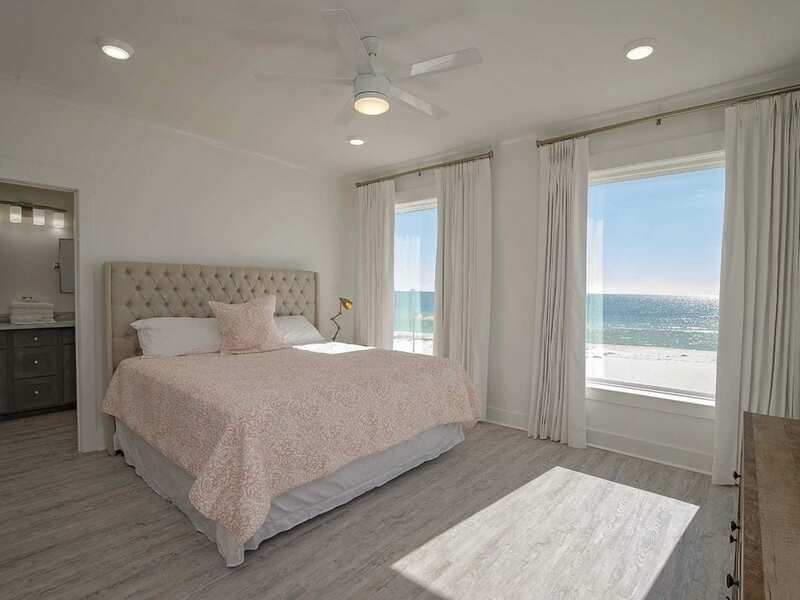 Best of all, Gulf Shores is only an hourlong drive from cities like Mobile, Alabama and Pensacola, Florida, making it super easy to reach for a quick beachfront getaway. 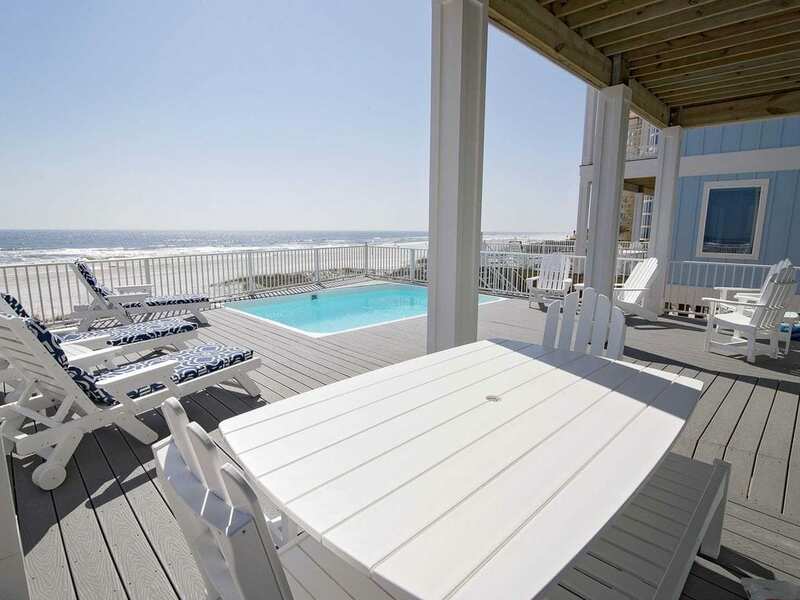 In case you’re wondering where to stay in Gulf Shores, we’ve got your back. The best places to stay on the Gulf Coast of Alabama are definitely Fort Morgan to the west, Gulf Shores at the center, and Orange Beach to the east. 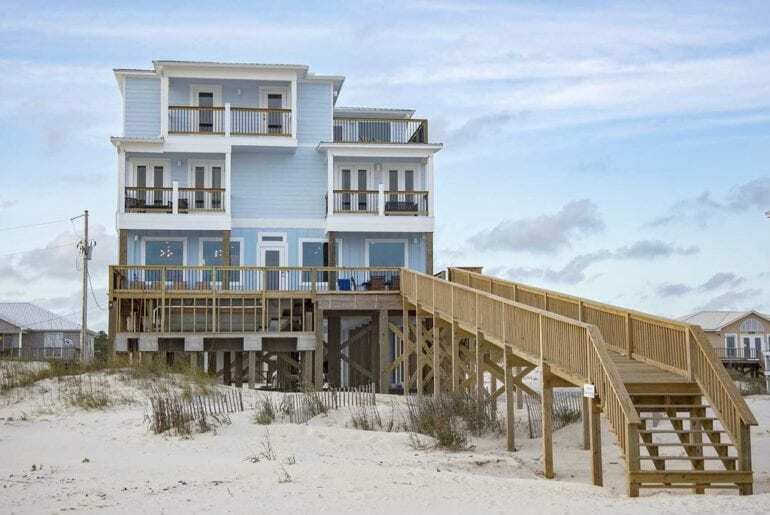 We’ve rounded up all of the best Gulf Shores VRBO rentals for you below! 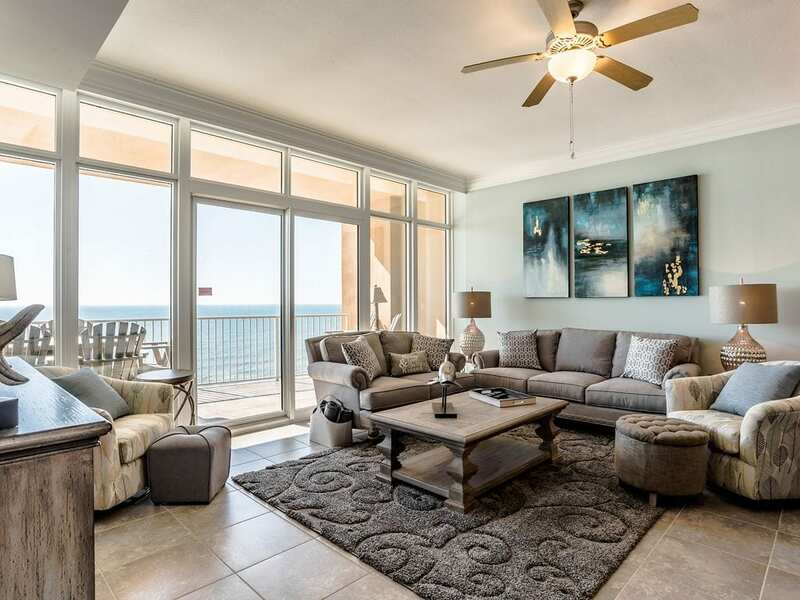 Let’s kick off this list of the best Gulf Shores VRBO vacation rentals with this stunning, corner-unit condo with ocean views! The Phoenix Gulf Shores community offers excellent resort-style amenities like a huge swimming pool with water slide, fitness center, and tennis court. This spacious condo vacation rental is perfect for a family or group of friends, accommodating up to 14 guests easily from around $565 a night. 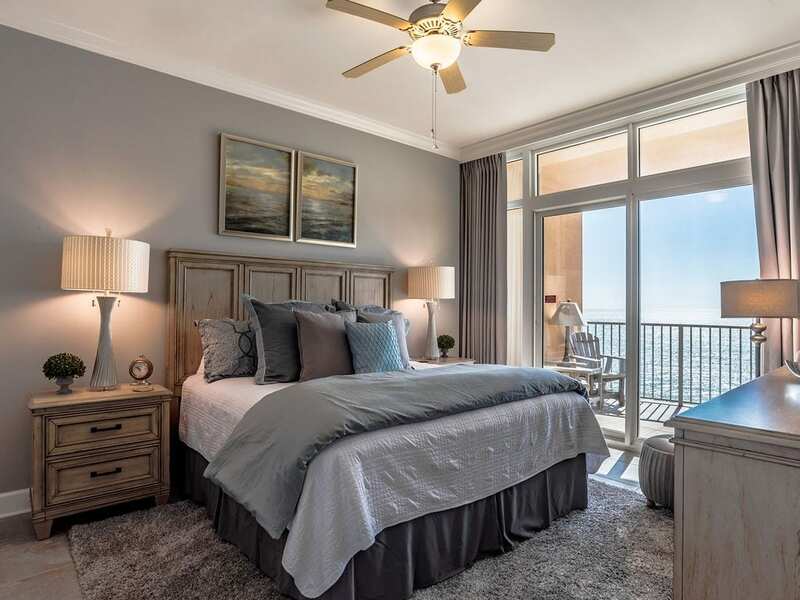 The condo’s four big bedrooms include a master suite with a king bed, another king bedroom, and two more bedrooms with two queen beds each, along with three full bathrooms. The bright and airy living space flows from a modern, gourmet kitchen into a dining area and onto the wrap-around balcony which boasts beautiful beach and ocean views from two sides of this stunning corner unit. This central, Gulf Shores location is also convenient to multiple shops, restaurants, and attractions nearby. 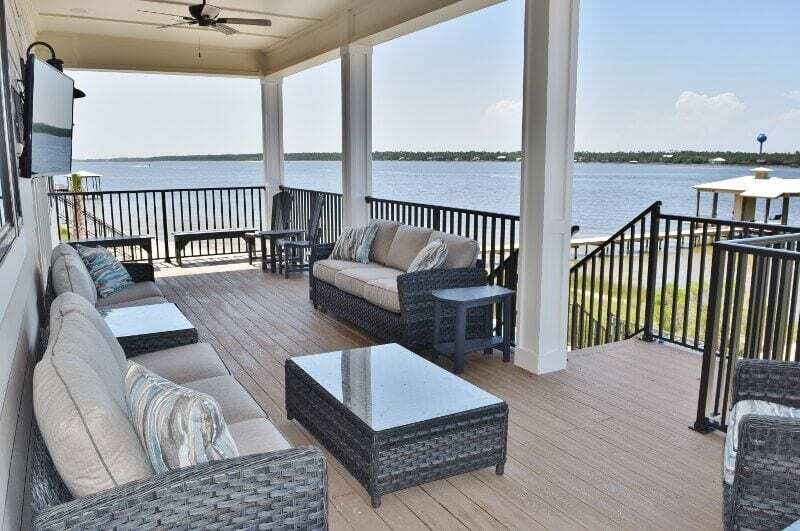 Just off of State Route 182, this luxury Gulf Shores VRBO beach house faces a peaceful, pretty lagoon on one side with the Gulf beaches just steps away on the other. No detail has been overlooked in this custom-designed, luxury home, which features an elevator, private heated swimming pool, and your own private fishing pier on the lagoon. 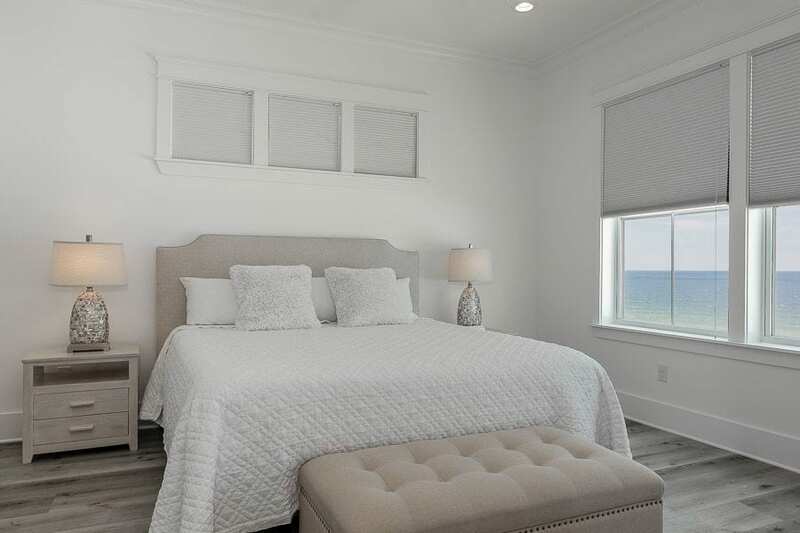 With six big bedrooms and 6.5 bathrooms, this vacation rental can easily accommodate up to 18 guests and is available for around $580 a night. 4,500 sq.ft. of living space is centered around a huge, open-concept floor plan. 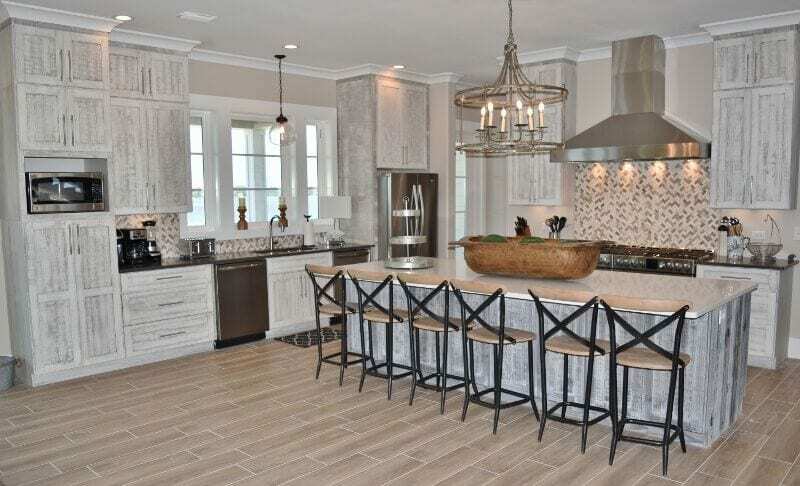 The jaw-dropping gourmet kitchen overlooks a dedicated dining space as well as an enormous living room with comfortable seating and a flatscreen TV. Porches on either side offer beautiful views of the pretty lagoon in one direction and sandy white dunes and ocean in the other. 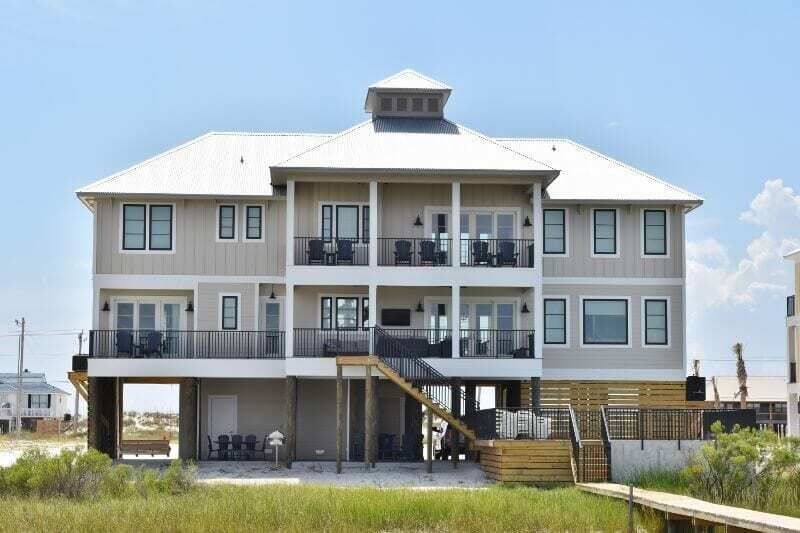 This huge home is great for a group of multiple families or lots of friends seeking a relaxing beachside getaway on the Gulf Coast of Alabama. 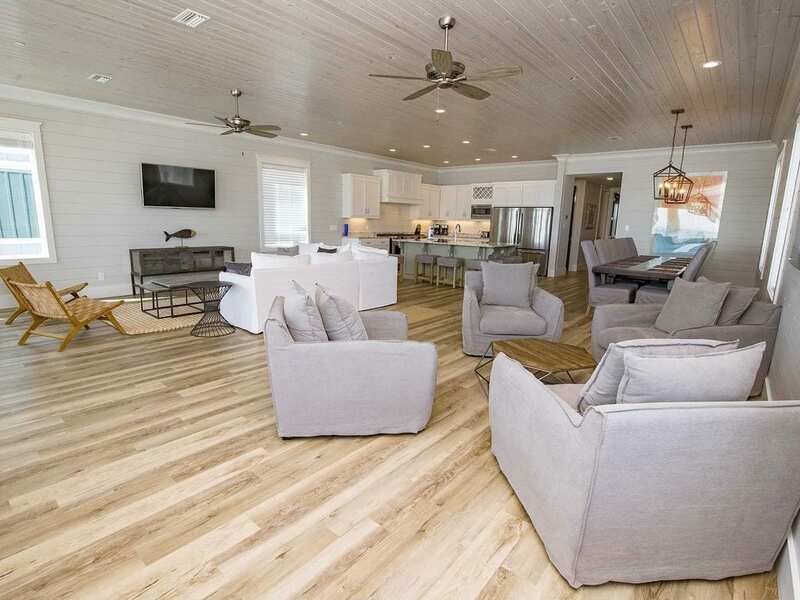 If it’s a bit more peace and privacy you’re after, keep driving west along Alabama’s Gulf Coast until you arrive at this zen-like beach house VRBO in Fort Morgan. Picture a pristine plot of soft, white sand with the great blue Gulf of Mexico stretching endlessly out in front of you. You’ve arrived in absolute Gulf Shores VRBO luxury! This pretty property sleeps up to 14 guests and can be booked for around $500 a night. 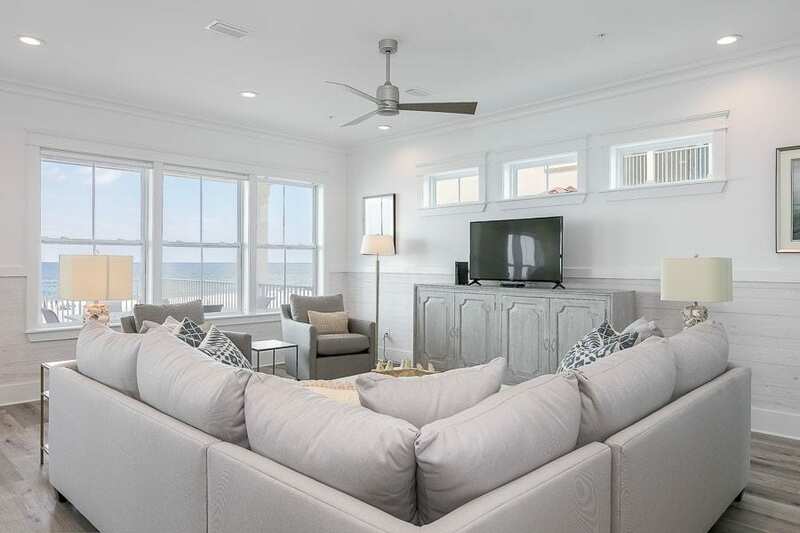 The large and airy open-concept floor plan is decorated in a calm color palette and minimalist style, creating the ultimate peaceful, beachfront retreat. Step through sliding glass doors and out onto your private deck with swimming pool, sun loungers, and gorgeous views of a perfect white sandy beach. The house has four bright bedrooms and 5.5 bathrooms, so everyone in your group has plenty of room! Fort Morgan is one of the best places to stay on the Gulf Shores of Alabama, with incredible beaches, a fantastic museum and 19th-century fort, plus many charming, casual restaurants. 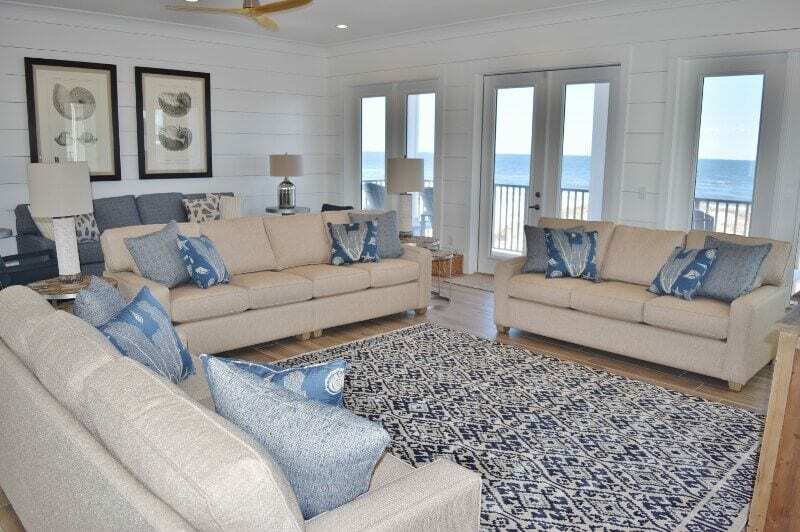 We are positively swooning over this gorgeous, oceanfront beach house vacation rental in Gulf Shores — and it’s not hard to see why! Take one step out onto the private deck and see the absolutely jaw-dropping view. The Gulf of Mexico is basically your backyard. This impressive home sleeps up to 25 guests easily, with 4,500 sq.ft. of living space, nine bedrooms, and ten bathrooms. Available for around $900 a night, this spectacular home is ideal for large groups of friends, a reunion, or multiple families traveling together. Spread out over three levels, the home has its own elevator, a private swimming pool overlooking the sand dunes, and a huge media room equipped with games and a foosball table. 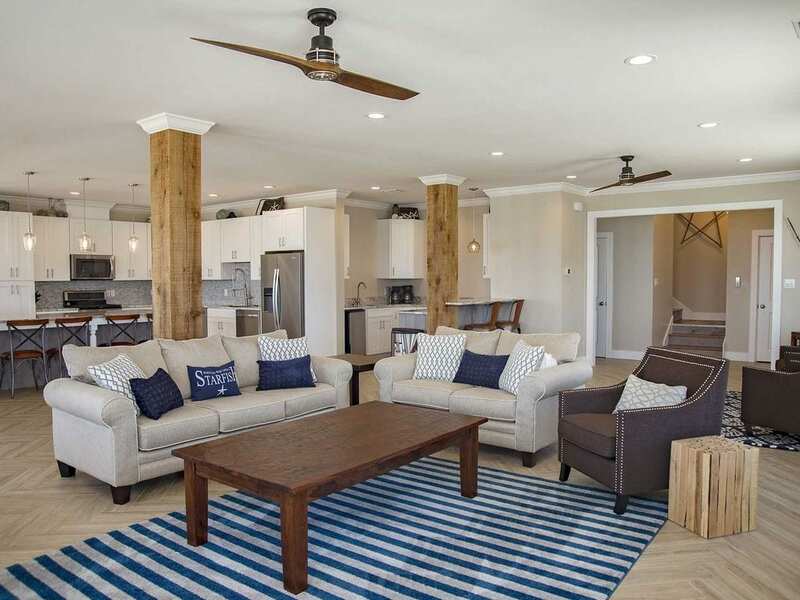 The gorgeous main living space is open-concept and beautifully designed, with herringbone pattern wood floors and wood siding accents, giving the space a rustic beach house feel. This peaceful, private lot offers tons of space and pristine shoreline while still being just a short drive into town for shops, restaurants, and other Gulf Shores attractions. 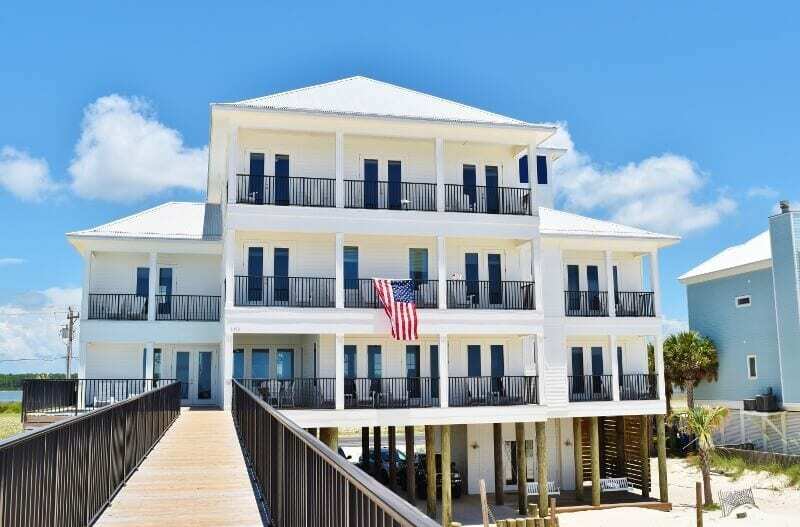 If you and 20+ of your closest friends or family are looking for a fantastic Alabama Gulf Coast VRBO, this enormous luxury beachfront property in Gulf Shores could be just the ticket! With 6,500 sq.ft. of living space including eight bedrooms and 10.5 bathrooms, this vacation rental is available for just shy of $1,300 a night. The property is ideal for athletic teams, family reunions, pre-wedding events, or even just a big group of friends on vacation together. Offering direct access to 100 feet of white, sandy beaches and an open, airy floor plan, this incredible home has everything you need to entertain a big group with ease. Each of the three levels has porches or balconies with incredible ocean views, perfect for relaxing with a cup of coffee or a cocktail. There is a large game room with a wet bar, foosball table, huge flatscreen TV and an oversized chess board. 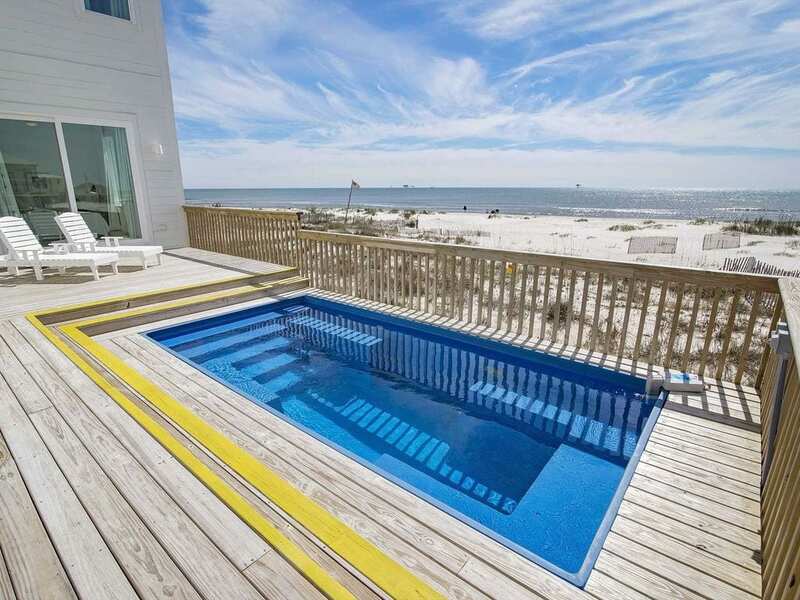 Outside, enjoy your own private swimming pool and plenty of sun loungers for soaking up the ample Gulf Shores sunshine. 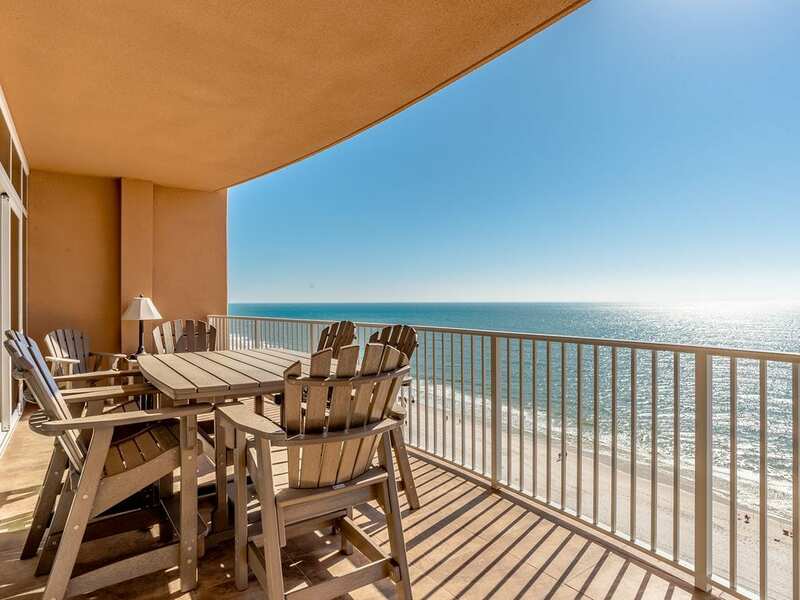 One of the most attractive Gulf Shores VRBO rentals is this incredible luxury condo at Phoenix Gulf Shores. This area is truly one of the best places to stay on the Gulf Coast, just steps from great restaurants and numerous Gulf Shores attractions. Located on a high floor in a desirable building, this particular condo offers stunning views of the ocean and beach from its huge shaded balcony. The property can sleep up to 8 guests with three bedrooms and three bathrooms, perfect for a small family or group of friends. 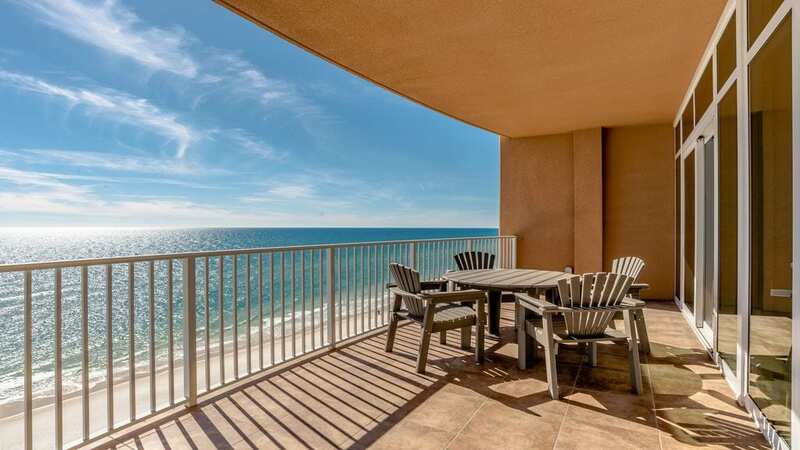 Available from around $530 a night, this fantastic condo is a great value in one of the most popular parts of Gulf Shores. Inside, the vacation rental has a spacious open floor plan with large living room, dining area, and modern chefs kitchen with stainless steel appliances. The complex itself has many attractive amenities for guests to enjoy, including multiple swimming pools, hot tubs, a state-of-the-art fitness center, kids club, and much more! 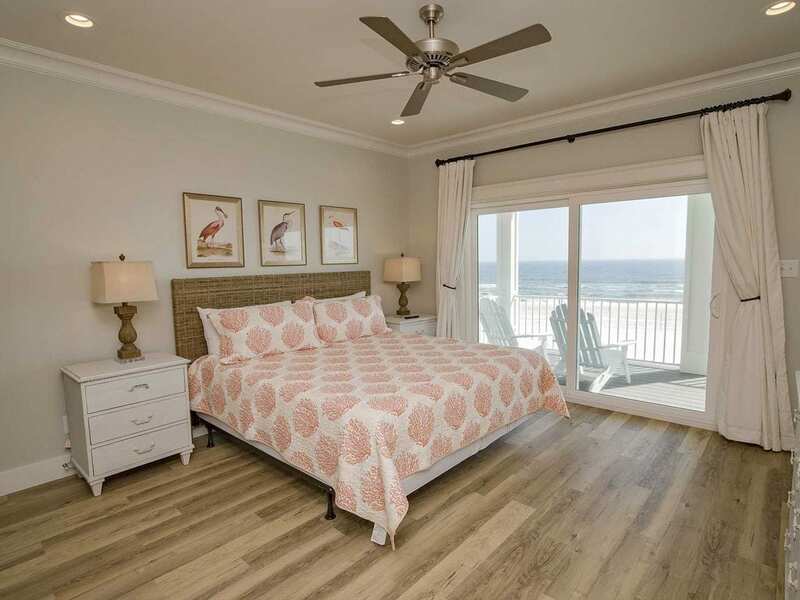 One of the newest homes on beautiful Orange Beach, this large Gulf Shores VRBO vacation rental property has enough space to accommodate up to 28 guests. 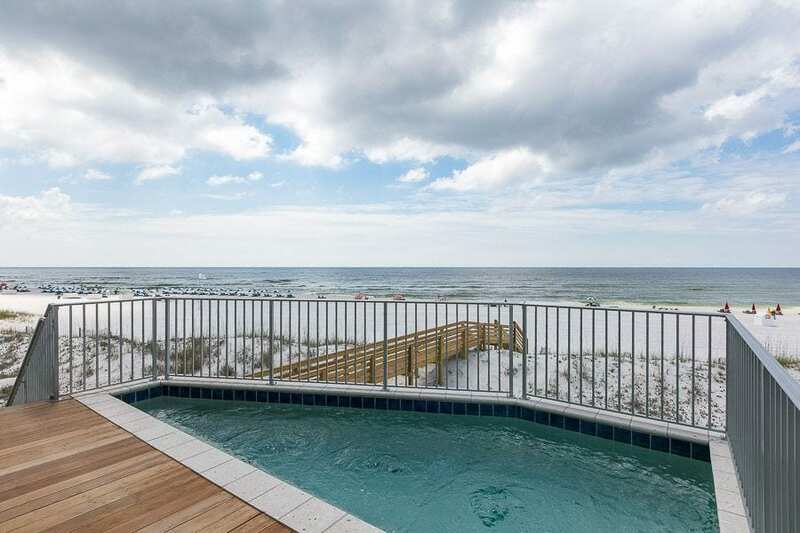 Enjoy breathtaking views of the Gulf of Mexico from every floor, but better yet, step out onto your private deck, down a short boardwalk, and hit the beach in seconds! When you’ve had your fill of sand and surf, take a refreshing dip in your private swimming pool to cool off. On chillier evenings, the pool can even be heated for maximum comfort. This 4,500 sq.ft. property has eight bedrooms and 7.5 bathrooms, with a small elevator to take you up and down every floor. 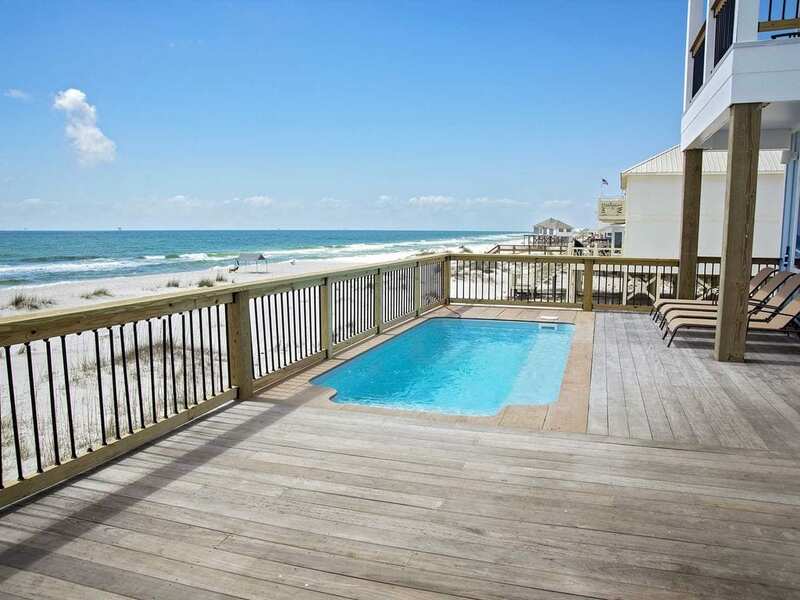 Available for about$950 a night, this Gulf Shores vacation rental is in one of the most popular areas of the coast, Orange Beach, near many great local restaurants and attractions. 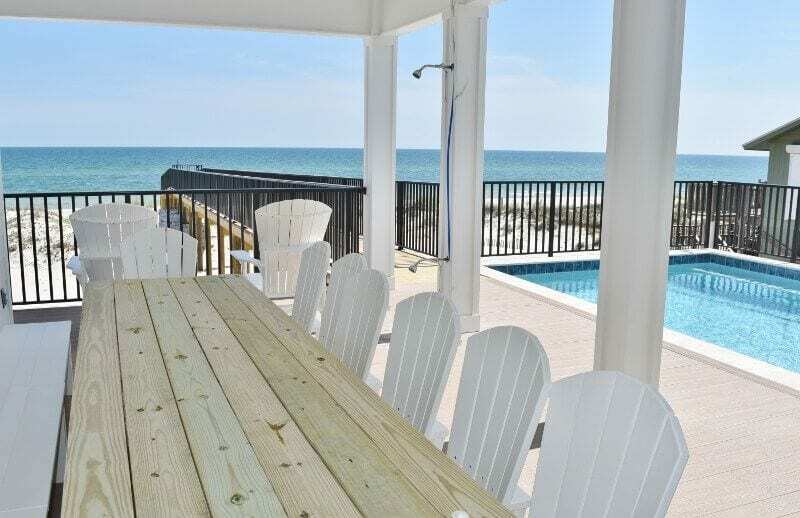 An excellent choice for a group of multiple families with kids, this beautiful property is sure to impress on your next Alabama beach vacation. Escape the stresses of daily life with a relaxing beachside escape. 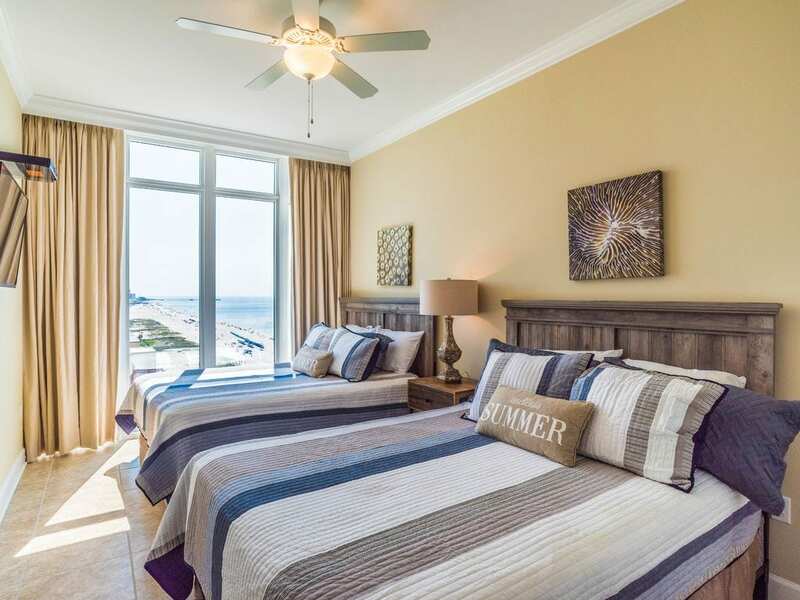 This gorgeous oceanfront rental in Orange Beach, Gulf Shores, will soothe you with its calming color palette and chic design. Little touches of nautical decor give the space a relaxing, coastal vibe while large windows and beautiful views keep the home feeling airy and open. Everything flows seamlessly from the open-concept living space out onto an outdoor deck with plunge pool, and private boardwalk leading to the sugary white sand. 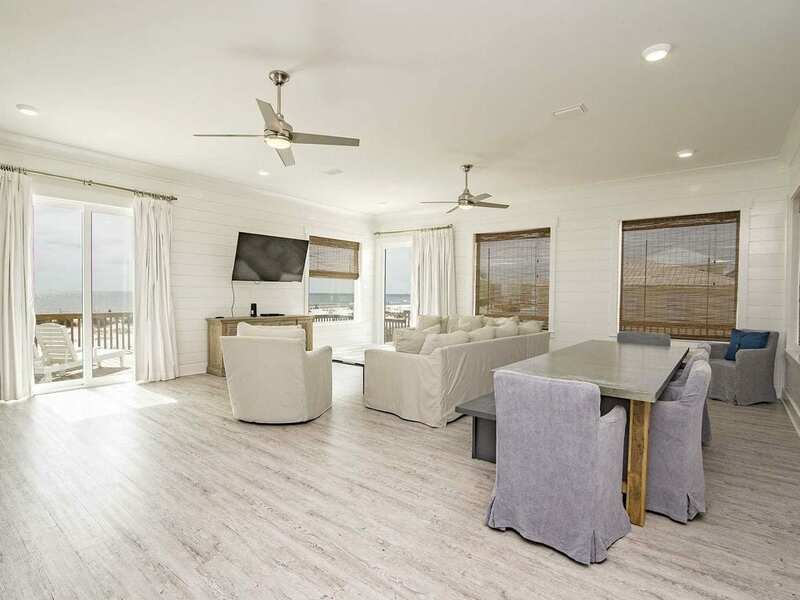 Available for around $1,300 a night, this luxury Gulf Shores vacation rental is designed with groups and families in mind. There’s space for 22 guests to sleep comfortably with eight bedrooms, seven bathrooms, and lots of room to lounge or entertain together. The home features a sleek, stunning chefs kitchen with stainless steel appliances as well as ample formal and informal dining space. Relax together in the large living room or retreat to the quieter lounge space for a bit of private time. 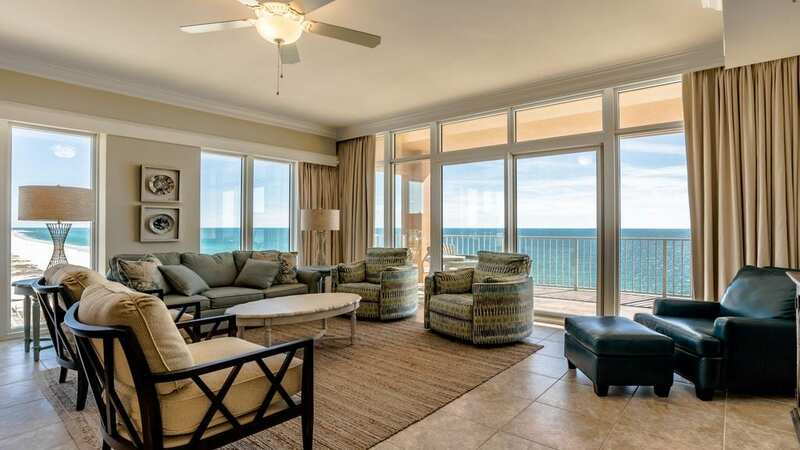 Overall, this is truly one of the most luxurious Gulf Shore VRBO rentals ever!